There are so many quirky and fun aspects of Fort Lauderdale; that’s what makes this seaside city so unique! Segway tours in Fort Lauderdale pair perfectly with the city’s interesting sights and adventurous personality, so it’s no wonder so many visitors view “The Venice of America” from one of these two-wheeled wonders. Here are some of the best places to rent one in Fort Lauderdale! Before making the journey to fun and historic Fort Lauderdale, don’t forget to create an itinerary! Aside from Segway tours in Fort Lauderdale, there are plenty of ways to immerse yourself in South Florida’s culture. See the sights, but also try local restaurants, bars, and activities. For suggestions, request access to our free Fort Lauderdale Vacation Guide! It’s full of local insight about the area’s best attractions. Fun Center Fort Lauderdale is a one-stop shop for all things adventure! This local outfitter specializes in group, private, and corporate events in addition to individual excursions. Fun Center Fort Lauderdale is also a great choice for international travelers; their multilingual staff is willing to welcome anyone to the city! There are so many other activities offered here, including: Waverunner rentals, banana boat rides, exotic car rentals, and much more! There are so many Fun Center segway options. Four different tours are offered: The Birch State Park tour, Birch State Park and beach tour, city tour, and private tour. If you’d rather blaze your own trail, the company offers rentals charged by the hour. Guided tours range between $60 and $100 per person, and rentals range between $44 (for 80 minutes) and $400 (for one week). Segway Fort Lauderdale specializes in segway adventures, but they also offer Vespa and jet ski rentals. This company is unique because it remains a charitable, small business that puts the community first. The owner of Segway Fort Lauderdale donates a large portion of his time to have fun with foster kids on his Segways. He teaches them how to ride, gives them tours at no cost, and appears at charitable events. Segway Fort Lauderdale tours are fun for everyone, but especially history buffs. Six different tours are available, including: The Segway experience tour, 5-mile yacht and mansion tour, 1-mile full city tour, night tour, nature tour, and historical tour. The company’s tours cost between $35 to $89 per person. Customizable tours are also offered in 5- and 10-mile intervals ($59 and $89 per person). Visiting Fort Lauderdale means experiencing a coastal vacation you won’t soon forget. 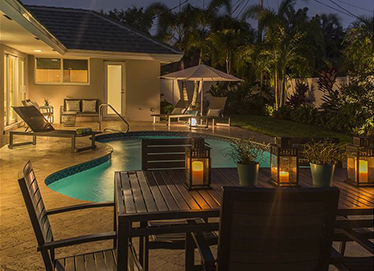 If you’re ready for a one-of-a-kind getaway in South Florida, check our availability today! We look forward to hosting you and your crew very soon. Christmas on Las Olas is the Best Way to Kick Off the Holiday Season — Unwind at One of the Best Spas in Fort Lauderdale!